In anatomy, the stomach is a hollow muscular organ of the gastrointestinal tract involved in digestion. The stomach serves as a sac for interim food storage and it also initiates the food breakdown process. Stomachs are found in both vertebrates and invertebrates. The structure and size of the stomach vary within vertebrates. It can be a simple tube resembling other parts of the gastrointestinal tract, as found in some primitive vertebrates, while in other vertebrates it is a definite structure. In birds, the stomach is made up of a proventriculus and a gizzard, both which work together in digestion. As with each part of a living organism (cells, tissues, glands, systems, etc. ), the stomach interacts harmoniously with other parts of the body to keep the organism functioning. In turn, the body as a whole supports the stomach and its individual need for maintenance. This provides an analogy with a harmonious human society, whereby each individual, family, institutions and so forth would provide benefit to the whole, with the larger society in turn providing benefit to each part. In humans, the stomach is a definite, bean-shaped structure of the gastrointestinal tract and plays a crucial role in digestion. 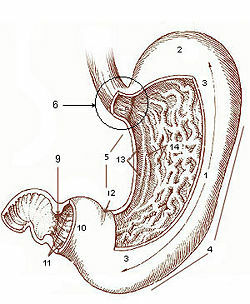 The stomach is located in the abdomen between the esophagus and the small intestine, sitting just below the diaphragm. It is a complex organ made up of several layers of membranes and different kinds of cells. The stomach as it is known in humans is discussed in greater detail below. The word stomach is derived from the Latin stomachus, which derives from the Greek word stomachos (στόμαχος). The words gastro- and gastric (meaning related to the stomach) are both derived from the Greek word gaster (γαστήρ). The stomach serves an important role in digestion, in which it has three main functions: Temporarily hold and store food, begin to breakdown macromacules (usually food) into smaller parts, and absorb certain molecules. In the human gastrointestinal tract and digestion system, food (or bolus) passes down from the esophagus into the stomach. According to the body's needs, the stomach decides what to do with the food. If the small intestine is full and busy absorbing molecules from a previous meal, for instance, the stomach temporarily stores the food. On the other hand, if the body is in need of nutrients and the small intestine is ready for absorption, the stomach begins to breakdown the macromacules found in the food and creates a semiliquid mixture called chyme. This decision making step of the stomach helps control the pace of the digestive system. The stomach of vertebrates is able to break down macromolecules due to its highly acidic environment, which causes molecular bond stress and forces them to break. The production and secretion of gastric acid produces a luminal pH of approximately 2-3 in humans, depending on the food intake, time of the day, drug use, and other factors. (The pH range found in the stomachs of various species can vary from 1 to 4, depending on the factors previously mentioned.) Such an environment enables the stomach to break down large molecules into smaller ones so that they can eventually be absorbed by the small intestine. The stomach can produce and secrete about 2 to 3 liters of gastric acid per day, with secretion levels peaking during the evening hours in humans. Assisting the acidic environment of the stomach are the various cells of the stomach, which release secretions that also aide in molecule breakdown and digestion. For example, pepsinogen is secreted by chief cells and turns into pepsin under low pH conditions. It is a necessity in protein digestion. Absorption of vitamin B12 from the small intestine is dependent on conjugation to a glycoprotein called intrinsic factor, which is produced by parietal cells of the stomach. Apart from temporarily serving as a food storage cavity and initiating the breakdown process, another function of the stomach includes absorbing some ions, water, and some lipid soluble compounds, such as alcohol, aspirin, and caffeine. 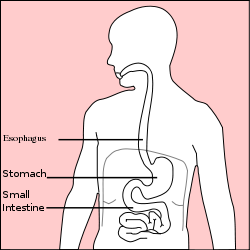 The human stomach lies between the esophagus and the duodenum (the first part of the small intestine). It is on the left side of the abdominal cavity. The top of the stomach lies against the diaphragm. Lying beneath the stomach are the pancreas and the greater omentum, which is a large fold of peritoneum that hangs down from the stomach. Two smooth muscle valves, or sphincters, keep the contents of the stomach contained. The esophageal sphincter is found in the cardiac region and divides the tract from the esophagus, and the pyloric sphincter divides the stomach from the small intestine. The pyloric sphincter stays closed until the food is in the proper condition to be passed on to the small intestine. The stomach is surrounded by parasympathetic (stimulant) and orthosympathetic (inhibitor) peluxes (anterior gastric, posterior, superior and inferior, celiac and myenteric), which regulate both the secretory activity and the motor activity of the muscles. In humans, the stomach has a volume of about 50 mL when empty. After a meal, it generally expands to hold about 1 liter of food (Sherwood 2004), but it can actually expand to hold as much as 4 liters. When drinking milk, it can expand to just under 6 pints, or 3.4 liters (Saladin 2004). At its widest point, the stomach measures 12 inches (30.5 cm) long by 6 inches (15.2 cm) wide. The terms greater curvature and lesser curvature are often used to refer to specific parts of the stomach. The greater curvature marks the inferior junction of the anterior and posterior surfaces. It is defined by the left, or lateral, and inferior border of the stomach. The lesser curvature refers to the right, or medial, border of the stomach. The superior junction of the anterior and posterior surfaces is marked by this curvature (Farlex 2007). The lesser curvature of the stomach is supplied by the right gastric artery inferiorly, and the left gastric artery superiorly, which also supplies the cardiac region. The greater curvature is supplied by the right gastroepiploic artery inferiorly and by the left gastroepiploic artery superiorly. The fundus of the stomach, and also the upper portion of the greater curvature, are supplied by the short gastric artery. mucosa the first main layer; this consists of an epithelium, the lamina propria underneath, and a thin layer of smooth muscle called the muscularis mucosae. submucosa this layer lies under the mucosa and consists of fibrous connective tissue, which separates the mucosa from the next layer; the Meissner's plexus is in this layer. located under the submucosa; the muscularis externa in the stomach differs from that of other GI organs in that it has three layers of smooth muscle instead of two. Inner oblique layer: This layer is responsible for creating the motion that churns and physically breaks down the food. It is the only layer of the three that is not seen in other parts of the digestive system. The antrum has thicker skin cells in its walls and performs more forceful contractions than the fundus. Microscopic cross section of the pyloric part of the stomach wall. The movement and the flow of chemicals into the human stomach are controlled by the autonomic nervous system (specifically the sympathetic nervous system), the vagus nerve, and by the various digestive system hormones. The autonomic nervous system acts as a control system, maintaining homeostasis in the body. These maintenance activities are primarily performed without conscious control or sensation. It is believed that the stomach operates independently of the central nervous system (Columbia 2003). Gastrin The hormone gastrin causes an increase in the secretion of hydrochloric acid (HCl), pepsinogen, and intrinsic factor (from parietal cells) in the stomach. It also causes increased motility in the stomach. Gastrin is released by G-cells in the stomach to distenstion of the antrum and digestive products. It is inhibited by a pH normally less than 4 (high acid), as well as the hormone somatostatin. Cholecystokinin Cholecystokinin (CCK) mostly effects the gall bladder, but it also effects the stomach by decreasing gastric emptying. Historically, it was widely believed that the highly acidic environment of the stomach would keep the stomach immune from infection. However, a large number of studies have indicated that most cases of stomach ulcers, gastritis, and stomach cancer are caused by the Helicobacter pylori infection. One of the ways it is able to survive in the stomach involves its urease enzymes. These metabolize urea, which is normally secreted into the stomach, to ammonia and carbon dioxide, both of which neutralize gastric acid and thus prevents its digestion. In recent years, it has been discovered that other Helicobacter bacteria are also capable of colonizing the stomach and have been associated with gastritis. The stomach, or a related structure(s), is found in both vertebrates and invertebrates. The shape, size, and anatomy of the stomach can vary, however, depending on the species. Carnivores tend to have more developed stomachs than herbivores due to their less frequent, heavier meals. Several exceptions exist however (McGraw-Hill 2002). In ruminants, such as bovines, the stomach is a large multichamber organ, which hosts symbiotic bacteria that produce enzymes required for the digestion of cellulose from plant matter. The partially digested plant matter passes through each of the intestine chambers in sequence, being regurgitated and re-chewed at least once in the process. In some animals, such as cats and dogs, the pH of the lumen is lower, usually between 1 and 2. In contrast, the human stomach pH is usually between 2 and 3. Columbia Electronic Encyclopedia (Columbia). 2003. Stomach. Columbia Electronic Encyclopedia. Columbia University Press. Retrieved July 14, 2007. Farlex. 2007. Greater curvature of stomach. Dorland's Medical Dictionary for Health Consumers in The Free Dictionary by Farlex. Retrieved July 14, 2007. This page was last modified on 22 October 2015, at 15:44.